5. Inability to hold leads – Two goal leads against Manchester United, West Brom and Everton, as well as being in front in games against Wigan, Newcastle, Chelsea, Norwich, Fulham, Southampton, Swansea, QPR, and Liverpool. I suppose we can look at it in a positive way, that we were good enough to get in front in those games but that’s 28 points we have dropped from winning positions this season, that is pretty poor and needs addressing. 4. Goals from Midfield – Very disappointing. The performances have been decent and at times superb, but the goals coming from midfield have really been our let down this season in an attacking sense. WE SCORED MORE OWN GOALS THAN GOALS FROM MIDFIELD THIS SEASON. Apart from that we saw five goals come from the back line. In the league, Brett Holman chipped in with one goal as did Karim El Ahmadi, but apart from that there wasn’t any contribution. I count N’Zogbia as a forward player, as he played apart of a front three or front four this season. Sylla, Delph and Westwood look decent in there together as a three but they are all very similar. My opinion is we need a player similar to like what Milner was like, where he would get eight or so goals a season from midfield. Delph v Fulham: 1-0 up in control and he heads the ball into his own net with nobody around him. Probably not all his fault as the ball was too high and was not given a call. Baker v Reading: I will not make comment on this, just watch it. Baker v Wigan: Am I being harsh? Absolutely not, once he seen the ball had beaten him, he stood flat-footed in the penalty area facing his own goal, what does he expect? Clark v Man City: You are good on the ball Ciaran, but we don’t need Ciaran Cryuff, when you are last man. Southampton Penalty: Oh dear, oh dear, oh dear. Delph kicks it against his own player and then Baker and Stevens leave it for one another as Rodriguez does a Tom Daley 7.9 dive over and wins a penalty. Joe Bennett v QPR: a five yard pass, nowhere near his target, minutes after coming on. Joe Bennett v Norwich: A costly penalty conceded when he didn’t need to foul him. Shay Given v Everton (Home): That was awful. Watch again. Clark v Everton (away): School boy defending from a defender that has played international football. Westwood v West Ham: not much he could do to be honest, but under no pressure it was unlucky and a game we was 2-0 up in nearly come back to haunt us. Two Penalties v Man City: OK we were 1-0 down, but if you remember Joe Hart needed a world class save to stop Benteke, so we were very much in the game when these two handballs happened. Now they are just incidents which were absolute gifts, the general defending, such as ball watching and slack marking, has been very sloppy, but looking at that list, at least TEN of those absolute gifts cost us three points. 2 Disastrous December – After beating Norwich in the cup and then Liverpool at Anfield, the confidence was high going into the Chelsea game. We were playing with this 352 formation and it was working for us, however this game really found out our weaknesses. 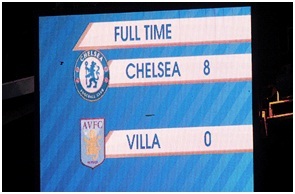 Yes, Chelsea are a better side, and,yes, they should beat us, but not by eight goals. A shocking goal in the first couple of minutes set the tone and it was evident by the 20 minute mark that they knew exactly how to play against this Villa formation. What was worrying was that I could see it, a few fans picked it up, and even Gary Neville commented on it in commentary… Chelsea left three men up when we attacked, leaving us three against three. At no point did the manager address this situation and alter to a four, that was the worrying thing. If he had, I think we would have got away with something a bit more respectable than eight, probably only half of that. OK, 4-0, is still not great but it is nowhere near as damaging as what 8-0 is. However it happens, what was most concerning is that against Tottenham and most importantly Wigan, the manager did not alter the formation that had just conceded eight goals, then four goals. I believe even if we had lost to Chelsea and Spurs and beaten Wigan we would not have been in a relegation battle. 1 Bradford City FC . I will not reflect on this too long as it is depressing (see here for full depressing view), but in a season where we beat Man City away, destroy Norwich away and then get the favourable draw of Bradford and the first leg away away, we were surely nailed on to reach Wembley? Wrong! A three-year problem of not being able to deal with set pieces really did undo us across two legs. OK, I’m depressed now.. moving on! Before the Top 5 in earnest, since we wanted to stick to the matters of football on the pitch, a notable mention here to what of course would have been the number one ‘high’, the season-long support of Stiliyan Petrov by both supporters and the club. Whilst it is a shame to see that Stan will no longer play football again, which most of us expected, it was encouraging to see 98% of Premier League’s team’s fans join the Villa fans in their superb support of Petrov. What was even more extraordinary was the fact that a man, who is fighting such a heartbreaking battle, took the time as often as he did to get down to the games to support his team. 4 Sunderland 6-1. Whilst people will argue that games with Stoke and Norwich may have been as important, the manor of this victory was outstanding. Against a team who boasted a Judas as their manager all season, then replaced him (when they realised he ain’t nothing without a cheque book) with a man who taunted Villa fans as we knocked his team out the cup. Oh man, it was fun spanking these. It was a nervy weekend whilst we watched other results and waited for the Monday evening for a game that we had to win. We had been looking over our shoulders all season at the goal difference, which dramatically improved on his Monday evening. Six excellently taken goals, with a hat-trick from Benteke, really made it one of the most memorable nights in recent Villa Park history. 3 Character. A young side that has taken many hits this season have shown the character to pick up points in the business end of the season. Reading away was vital and we saw the courage to come back from a goal down and we did the same against QPR. Vital wins against Stoke and Norwich away, were really important and the demolition of Sunderland was icing on the cake. 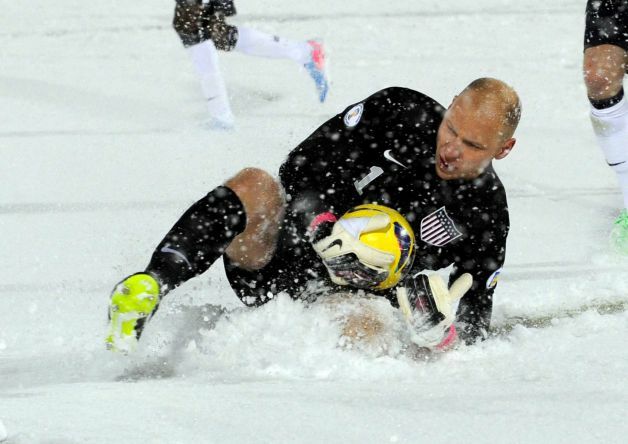 2 The development of the young players, most notably Brad Guzan. I was considering giving Baby Brad his own section, but I will include him in here. This is a keeper that during his first few years with us would be unbelievable at penalties, a decent shot-stopper and in one-on-one situations, but very poor from balls into the box. Oh, how he’s improved. His commanding of the area has been superb and has been magnificent for us. Ashley Westwood has nailed down that central midfield role but just needs to add goals to his game, but he has been one of the stars of the season, as has Matthew Lowton ,who has the ability in my opinion to go on and become Villa’s greatest ever full back in the Premier league. Andreas Weimann’s work rate, constant movement and ability to score goals has really made him a hit with the Villa fans this season, but still has a lot to learn in his all round game. We have seen a development in the likes of Nathan Baker, who at times is very rash, flat footed with no composure, but his reading of the game has improved and is never afraid of a tackle. Yacouba Sylla has come in and done very well, and it will be interesting to see him after a full pre-season. Fabian Delph has had his best season at the club but really needs to add goals to his game. With players like Jordan Bowery, Gary Gardner, Samir Carruthers, and more, that will be hoping to get more action next season, we could see this development reach another level. 1 Christian Benteke – The bargain of the season? Absolutely! Remember he has done this in his first season in English football in a struggling side. Would you call him the best striker Villa have had in the Premier League? Arguably Yes, although Dwight Yorke would have something to say about that. If you remember though, it took Dwight a few seasons to hit form. Benteke reminds me of what Dalian Atkinson was, but better. Raw power (peel Chris Smalling off the floor in the Trinity Road stand and ask him), speed, the ability to go past people, hold the ball up, bring people in to play and the ability to score all kinds of goals and at crucial times. Please keep hold of him. but we are staying up & onwards & upwards UTV ! !